Tips Traps and Tricks for making money with Poker and Casino affiliate programs from an 8 year affiliate veteran. It is old news, but if you were an affiliate of the old Full Tilt Poker you are screwed. Payments owed to Full Tilt Poker affiliates will not be paid, and player accounts will not tracked to old affiliates when the website comes back online next month, pokerfuse has learned. In addition, players who were also affiliates will not be reimbursed for any money in their Full Tilt account that came from affiliate payments. It’s bad enough that they aren’t honoring money already owed to affiliates which was just as much an obligation of the Full Tilt company as player balances, but they have also set it up to remove any affiliate money owed from players who were affiliates but where part of the money in their account came from affiliate income. So, let’s say an affiliate was paid for advertising (affiliate income) 6 months before Full Tilt went under, but they still had that money in their poker account. Whoops it’s gone! Q1. Where do I create the goto.php file? Where should it be placed exactly? Q2. Will this allow me to use 1 tracking code for each affiliate link so that if I have to update an affiliate link in the future, I would just change the affiliate link in the goto.php file? That's exactly right and is one of the big advantages of handling your affiliate links this way (the other big advantage being hiding them from your customers). Q3. Will this also track how many times a user clicks on the affiliate links? If you are using Google Analytics as I described in a previous post then you can format your links as follows to track them. Normally this page wouldn't be tracked by Analytics because it is just a redirect page. is the critical section that allows Google Analytics to track clicks on the affiliate link. For this to work you must be using the new urchin code we described in the previous post. Ok, so you have a web site (or a blog) and you've created some great original content. How can you get information about who is visiting your site? Well there are a lot of options which range from using tools that are built into your site provider (including log analyzers like Webalizer) to systems costing several thousand dollars like ClickTracks pro. 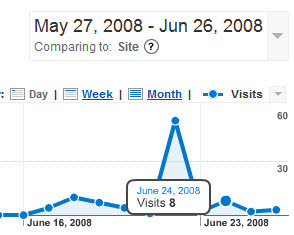 One of the nicest and most powerful tools, though, is completely free and provided by Google: Google Analytics. After you create your account by signing in with your google account (or creating one if you don't have one) you will be able to add your site to your analytics dashboard by clicking "Add Website Profile"
From here you first enter your site's domain name and select the radio button for "Add profile for a new domain" which means a new Google Analytics domain, not necessarily that your domain itself is new. On the next screen is the first "gotcha". By default Google Analytics has the legacy tracking code selected. You should click the tab for "New Tracking Code" (as we've done in the image) to use the most up to date tracking code. This is important because it allows you to track links that go offsite (like affiliate links!) and without using the new code you'll have no way to quantify how many people are clicking on your advertisement links and banners. This tracking code needs to go in the HTML of every page on your site, right before the </body> tag. We recommend that you set up the html files on your site with a php extension (even if the content is not dynamic--yet) so that you can use php include files to encapsulate code like the tracking code above. So you could paste the Google Analytics code for your website into a file called ga.php and then in your site files you can put right before the </body> tag. Again this will only work if you are using a file with a php extension, so you'd set up your index page as index.php. Don't worry you don't need to know a lot of php programming to do this, in fact you can put 100% html in this file and it will work just fine, but it will allow you to add bits of php into your HTML like the include above which are VERY nice. Also, if you decide to add other tracking to your site (e.g. Quantcast) you can simply add the extra tracking code inside the ga.php file and all of the pages that included that file are instantly updated. Ok, so you've got your tracking code set up in all the files you want to track in your site and you've clicked finish on the Google Analytics screen. Now you have to wait... Google Analytics processes data once a day, usually in the late-night/early-morning hours. The next day when you log in you can click view reports and get the actual reporting screen. And you can start seeing who's coming in, what pages they are visiting the most and lots of other information. We'll go into more of all that in future posts, but for now you've got some real data on your site and it didn't cost you a penny! If your goal is to really make a living as an affiliate, as opposed to making some extra spending cash, then you will have to move beyond the free sites like blogger and run some full featured domains. For example to use the PHP redirect technique we described a few posts ago you pretty much have to be running that php file on a hosted account. It just won't work on blogger, etc. Usually you'll start off with a shared hosting option. This means that your website is running on someone else's server and that server is also running other shared websites for other people/companies. The single advantage to shared hosting is price. The place we used to host from has an excellent basic hosting deal - LunarPages Basic Hosting which right now is about $5/month and is almost impossible to beat. If you want to take full control of your sites and if you will be hosting 20+ domains then you will want to have get dedicated hosting. For this we can definitely vouch for our current hosting company Liquid Web Dedicated Hosting where you can get a server to host all your domains for about $150/month. That may sound like a lot but consider you can host hundreds of domains on this server, which means you can really grow your online presence and business almost without bounds. If you are interested in becoming a sub affiliate under us (Low Limit Webs which includes the web sites listed in the first blog entry) then please contact us directly and let us know what you're doing and we will come up with a partnership that will benefit both of us. That means link exchanges, free advertising form us and more to help you succeed. Contact kmslogic@lowlimitholdem.com for more information on that. Let's say you want to create a poker or casino content site in blog form on blogger. There's a few advantages to doing this because the blogging accounts are free at www.blogger.com and it is fairly simple to create a professional looking layout in a matter of minutes leaving you free to supply the important stuff-namely content! By default your blog's name will be something like myblog.blogspot.com which is ok, but it's much more professional to use your own domain name so your blog becomes www.myblog.com. 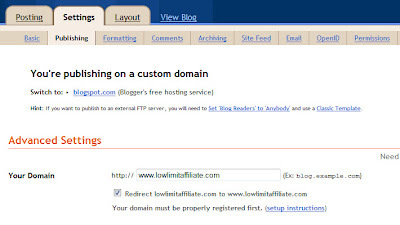 The blog you're reading now is lowlimitaffiliate.blogspot.com but you are reading www.lowlimitaffiliate.com most likely. Regardless of where you want to register your domain name the first step is just to go through the normal blog creation process at blogger.com. Now you need to purchase a domain and then make some minor changes to your DNS settings on your registrar. If you use GoDaddy then you should log in there and click on your purchased domain name (under My Domains) and you'll be taken to the following screen. Now click on "Total DNS Control and MX records"
Under CNAMES (Aliases) you should edit the www entry to point to ghs.google.com and under the A (Host) settings you should change the @ entry to point to the IP address listed above. Every other line should be deleted from the total DNS settings. Although it won't hurt to leave them people who go to those addresses will land on a GoDaddy page and you don't need to give them TOO much free advertising. Click on settings, and on the next screen select the "Publishing" tab. At this point you are good to go. Domain propagation is very fast and although some remote sites may take a couple of days you should be able to access your blog via www.yourblog.com within an hour (and most likely within minutes). One last thing: It's not necessary to have your blogger domain name match your custom domain name. The first thing you should do is find an available www. domain at a registrar and then purchase it. After that you can call your blogger account X9233932 or whatever you want and just redirect it to your purchased domain name. Programmer/Software Developer since 1982, Live Cardroom Poker Player since 1997.